Just thought I would report on last nights activities. 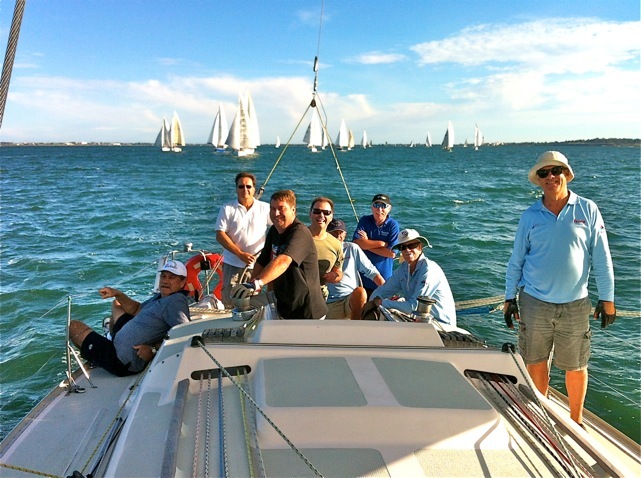 It was the annual Ford Regatta where Ford employees are able to get involved in the Twilight Racing series held by the Royal Geelong Yacht Club. Ford use this as a fund raiser for the Ford Geelong Community Affairs Committee, putting the money back into some needy causes in Geelong. I sailed on Reverie together with 4 regular crew and 5 Ford people. Reverie is a 38 foot yacht made by Bruce Farr and is owned by a syndicate of guys that regularly sail together. Its a great yacht and has done plenty of races in Corio Bay and a number of Tasmania circumnavigations. It was great weather for sailing, a mild 24, sunny and a good 15 knot wind. We all had a great time sailing. I took my regular place manning the winches. After the race we met Mum(Jenny) at the yacht club and had dinner with the Ford crew. Salt and Pepper squid, and a green curry for Jenny. I even managed to win a cap and coat in the raffle! looked great out there dad!! It was almost a perfect night for sailing. The weather was great and a 15knot+ wind meant we were able to have a nice sail. Didn’t come home too well in the results, but that didnt worry us. We were happy to be out there. The dinner afterwards was great too.